Our family always gets so excited to start baking during the holiday season. For us, the kick off is during Halloween and extending straight into Thanksgiving and then Christmas. 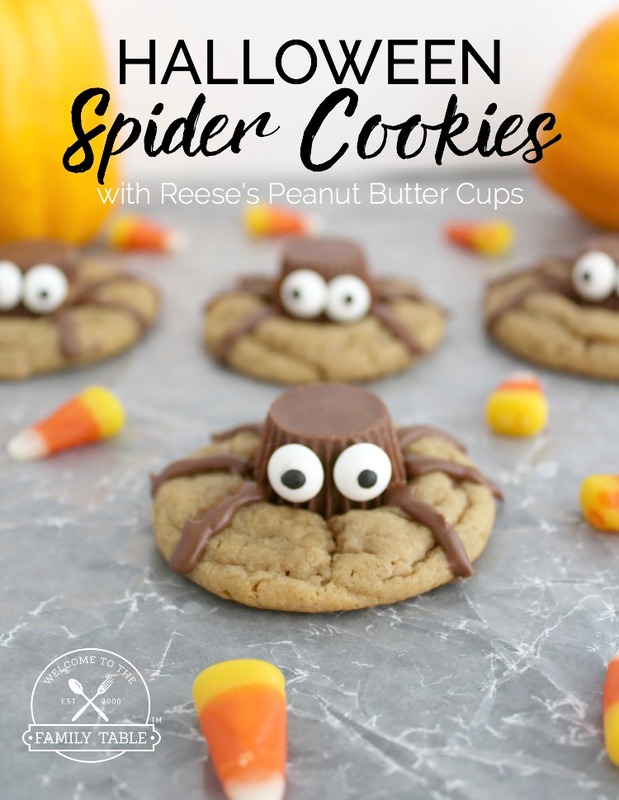 We love creating easy, fun, and delicious treats together. This Halloween chocolate bark recipe is not only easy but is also always a big hit at our seasonal gatherings! 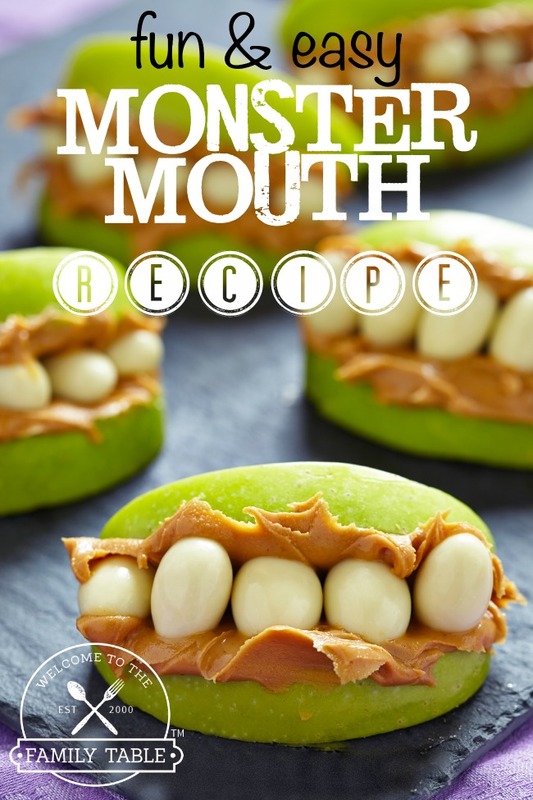 We hope that this fun recipe will become a staple at your next Halloween shindig and throughout the year. Enjoy! Line a large baking sheet with wax or Parchment paper and set aside. Add the semi-sweet chocolate chips to a microwave-safe bowl. Cook on high for 20 seconds, stir and repeat until the chocolate is melted and smooth. 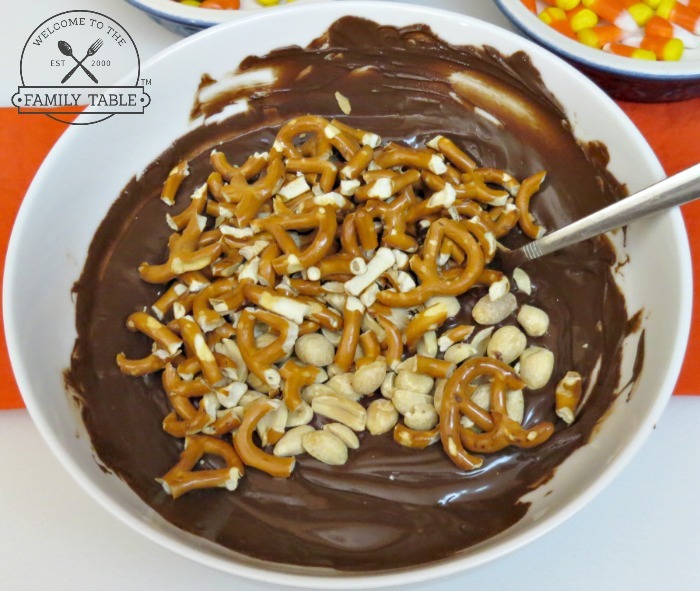 Working quickly, add the crushed pretzels and peanuts to the melted chocolate and stir to combine. Pour the chocolate mixture onto your prepared pan and spread it out to about 1/4″ thick. I find the using a chopping motion is easier than trying to spread it. You can also lift the pan about 12 inches off the counter and drop it. This works great for spreading it out. 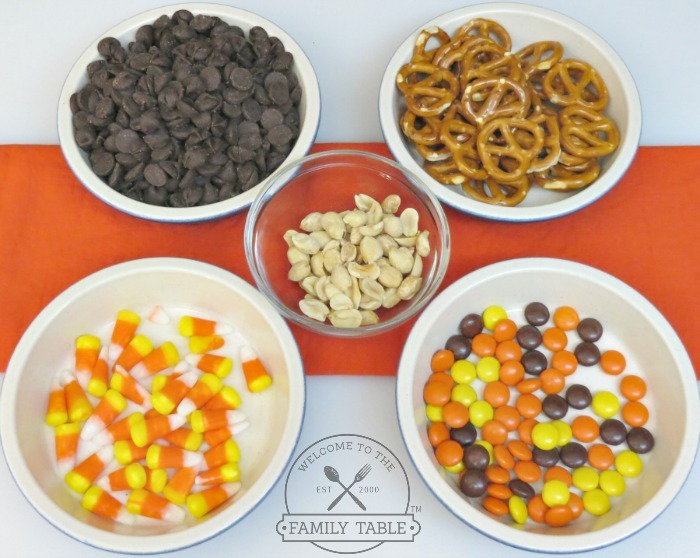 Sprinkle the Reese’s Pieces and candy corn all over the top. You can lightly press the candy into the chocolate or use the same lift/drop method as in the previous step. Refrigerate until set, which takes about 45 minutes. Break or cut into whatever size pieces you like! Keep this in the refrigerator until serving. I just crush the pretzels twists right in my hand as I add them to the chocolate, but you can do it beforehand if it’s easier. Feel free to change up the nuts or candy in this to make it your own or match your party theme! 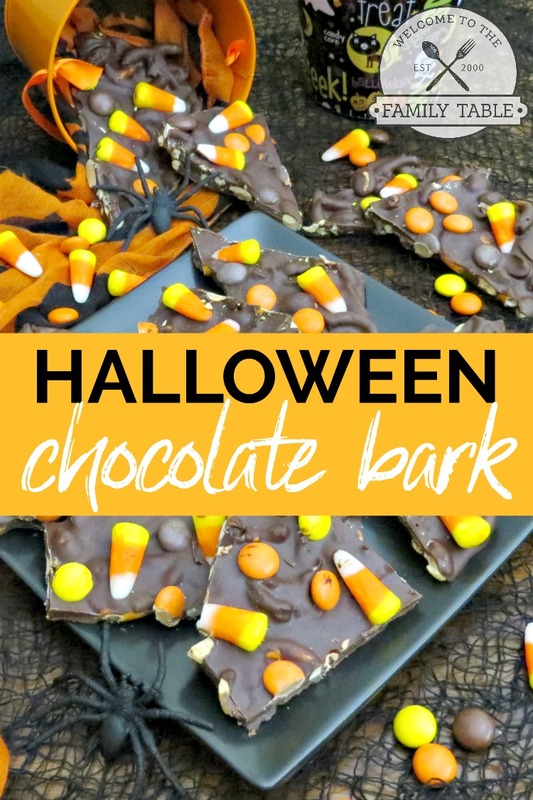 This fun and tasty Halloween Chocolate Bark recipe is sure to delight at any fall party! Pour the chocolate mixture onto your prepared pan and spread it out to about 1/4" thick. I find the using a chopping motion is easier than trying to spread it. You can also lift the pan about 12 inches off the counter and drop it. This works great for spreading it out. Sprinkle the Reese's Pieces and candy corn all over the top. You can lightly press the candy into the chocolate or use the same lift/drop method as in the previous step. I just crush the pretzels twists right in my hand as I add them to the chocolate, but you can do it beforehand if it's easier.